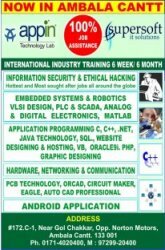 Join Appin 6 month / 6 weeks training program with Top MNC Placements in IT Security, Embedded,.Net, Java, PHP , Android App.etc. Now @ Ambala Cantt . CALL 0171-4020700 , OR SMS “9254355226”. Why Information Security & Ethical Hacking? After the boom in Networking and Software jobs, the past two years have seen a sharp rise in the field of Information Security. Information Security and Ethical Hacking is the latest buzzword in the industry. Avail group discounts, register soon and book your seat and avail the best opportunity the industry has to offer. For further details on Course, Training, Batches, etc… feel free to contact us. Call/SMS "APPIN” @ 0171-4020700, OR SMS “9254355226”.